For 10 years now, Zócalo Public Square has convened people in public spaces to talk about important issues and ideas. We do so in the belief that examining visceral, even contentious, questions in a civil manner fosters healthier, more cohesive communities. Zócalo reminds us that even in places that can feel disconnected, large numbers of people are eager for civic and intellectual engagement. In 2011, Zócalo established an annual book prize to honor writers who grapple with questions of community in a particularly illuminating and original manner. Our first winner was journalist Peter Lovenheim for In the Neighborhood: The Search for Community on an American Street, One Sleepover at a Time. Last year, sociologist Richard Sennett won for Together: The Rituals, Pleasures and Politics of Cooperation. Last week, we presented our three finalists for 2013. 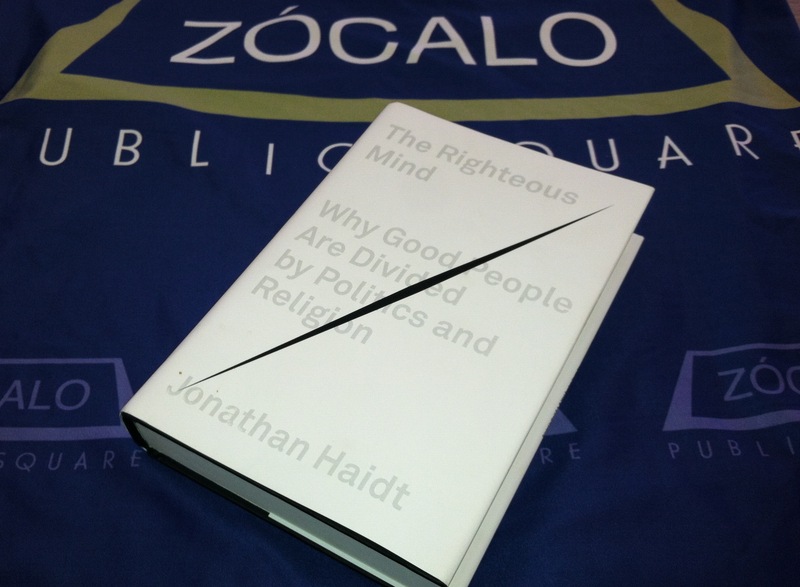 Today, we announce the winner of the $5,000 third annual Zócalo Book Prize: social psychologist Jonathan Haidt for The Righteous Mind: Why Good People Are Divided by Politics and Religion. We’re confident that our book judges were objective and impartial in picking the winner, but if they were guilty of blinkered biases and personal passions—well, that would make their choice all the more appropriate. In The Righteous Mind, Haidt argues that our morals and beliefs are far less reason-based than many of us would like to think. We often come to a conclusion first and then think up the reasons for it next; as a result, we misjudge people who feel differently. If we can take responsibility for breaking out of our righteous mindsets, we just might be able to understand and get along with one another better. Since we fancy ourselves an organization that tries to promote thinking outside the hive, we’re very pleased with the choice of our judges. Haidt has been a professor at New York University’s Stern School of Business since 2011. For 16 years before that, he was at the University of Virginia, where he conducted much of the research that became The Righteous Mind. Haidt’s research examines what he calls the “intuitive foundations of morality” and how they play out in different places and cultures. On Friday, May 3, Haidt will visit Zócalo to deliver a lecture: “Can Americans Learn to Reconcile Politics and Reason?” at MOCA Grand Avenue. See more details on the award ceremony, sponsored by Southern California Gas Company, here. Q. You write that we’re not easily persuaded by reason, but of course you employ reason to demonstrate that. Please discuss! A. Well, I’m not using reason alone. I structured the book carefully to make it an example of intuitionism in action. I used a lot of metaphor. I used emotionally compelling stories. I tried to make myself likeable. And then I gave the evidence. I’m not saying we’re incapable of reason. I’m saying that as individuals we’re terrible at reasoning for ourselves, because of the confirmation bias. But if others give us evidence that disconfirms our beliefs—and if we’re emotionally open to those people—then we can change our minds and improve our thinking. Q. Which misunderstandings of your book have been most frustrating? A. The most disappointing reactions are from philosophers who simply hate reductionism, even when it’s paired with emergentism. Some people in the humanities just hate the idea that complicated things, deep aspects of our humanity, might be explicable even in part by genetics or neuroscience. What disappoints me is that I see my book as an example of what E.O. Wilson calls “consilience.” The heroes of my book are Charles Darwin and Emile Durkheim. I love going down into material processes, and also up into symbolic meaning systems and social processes. That’s how you develop a complete understanding of something like morality, which can’t be understood at a single level of analysis. Q. You talk in your work about group cohesion. One form of cohesion that is often discussed is national loyalty versus more universal loyalty to humanity. What are your own moral views on whether Americans should care more about Americans than people of other nations? A. Liberals are often wary of patriotism because it seems to exclude others and perhaps even threaten them. Yet social psychologists have long known that increasing love of one’s in-group does not necessarily bring with it increased hostility to out-groups. Playing sports makes you love and trust your teammates, without hating the other players. Adam Smith observed that “the interest of the great society of mankind would be best promoted by directing the principal attention of each individual to that particular portion of it, which was most within the sphere both of his abilities and of his understanding.” It’s good for people to love their own spouse more than other spouses and to love their own country more than other countries. Q. There are joiners like the 1930s fascists or communists who remained blind to all faults on their own side, and then there are loners like George Orwell, who seemed extraordinarily immune to some of the moral and logical blindness common to human beings. What characterizes the clear-eyed person who can see the truth in front of his nose from the person who can’t? A. One of the three principles of moral psychology that I present in the book is “morality binds and blinds.” Some people do this with more gusto than others. Some people crave the security and moral certainty that comes with joining a group that is engaged in ideological battles. Orwell, somehow, didn’t just join the left and go blind. I don’t know if the reason is to be found in his personality—perhaps he was more secure or more of a loner—or whether it is to be found in some of his idiosyncratic profile of experiences. A deeply disillusioning experience can snap one out of a dream, as happened with Orwell during the Spanish Civil War. Then again, Robert Frost defined a liberal as a man too broadminded to take his own side in a quarrel. So Orwell might be an example of the true liberal—not just a partisan, but a true descendent of the Enlightenment, which many leftists are not. Q. Thomas Jefferson founded your longtime place of employment, the University of Virginia, and his musings on human nature make it into your book. Give us some thoughts on the man. A. Back in 1999, Jefferson was on almost every list of the greatest people of the second millennium. At UVA, everyone is a member of his cult. I revered him, and I often felt as though I worked directly for him. Of course, he was also a hypocrite. While I worked at UVA, the genetic analyses were released proving once and for all that he had fathered children with Sally Hemmings. And yet, near the end of his life, he preferred to spend his money on more books and more wine, rather than on freeing his slaves, as George Washington had done. But that’s one of the points of my book—that our behavior is governed by forces largely separate from our lofty reasoning. His words were divine. His deeds were those of a normal man of his time.